You are currently browsing the tag archive for the ‘‘A Journey’’ tag. I have been waiting for the excuse to review this book for some time. Robert Harris’ thinly disguised poison letter directed at Tony Blair’s regime has already been made into a film, powered by the still vibrant anger felt by many Britons towards the Teflon Prime Minister. I was interested in reading the book, but decided to wait until the two men who defined the War on Terror released their own biographies. Tony Blair’s A Journey was a best-seller that inspired an unusual campaign by protesters to move the book to the ‘Crime’, section. Last week George Bush published his memoirs following the American mid-term elections. Apparently the most distressing event in his two terms of office was having Kanye West complain about his reaction to Hurricane Katrina. I wanted to know if Harris had sketched out a self-fulfilling prophecy of sorts years before these two former heads of state returned to the media scrum to defend their actions. Each chapter of this book opens with a quote from Andrew Crofts’ Ghostwriting, introducing us to the life of a professional ghost writer. British Prime Minister Adam Lang has retreated to Martha’s Vineyard to ‘write his memoirs’. Unfortunately his last ghost writer has been found dead. That man’s replacement has arrived from London with dollar signs in his eyes, eager to please and having won the commission due to his intention to write an autobiography’that has more in common with a celebrity tome than a political memoir. He wants to tell a story with heart, which appeals to both Adam and his wife Ruth. They are eager to regain the love of the British people, as since his stepping down he has become the most hated man in Britain. Our nameless ghost simply wants to clean up the material his predecessor McAra wrote, take his cheque and maybe get a mention on the acknowledgements page. He finds Adam Lang to be a very willing subject, charming and happy to engage his ghost-writer with personal reflections not common to most political biographies. The atmosphere at the retreat itself is close and it becomes clear that the marriage of the Langs is under enormous strain. Adam Lang himself seems more like an actor than a statesman, faking sincerity where genuine emotion is needed. Then a rival politican announces that charges are to be brought before International Criminal Court accusing Lang of war crimes. What’s more the ghost-writer begins to suspect that there was more to McAra’s death than suicide due to work strain. He discovers that he is being watched, with electronically saved documents vanishing from his computer and strangers accosting him in public. Could he soon share the same fate as McAra? What impresses most about this book is the tangible sense of anger. The arguments for and against the invasion of Iraq will continue to be debated, but what remains unusual is the refusal of Tony Blair in particular to acknowledge any responsibility for the colossal tragedy that followed his decision to go to war. Adam Lang’s need to be loved echoes that of Blair’s, the sole consistent aspect of his Prime Ministership being his love of associating with rock stars, whether it was the Gallagher Brothers during the Cool Britannia era, or Bono in the run-up to the G8 summit in Scotland. Therefore if Lang/Blair is to be loved, he cannot be the war criminal the British public see him as. 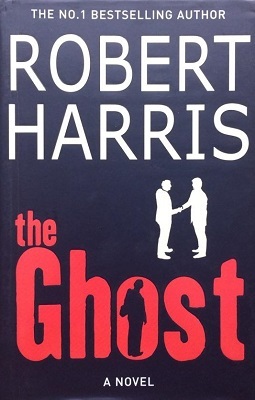 Harris wraps a gripping thriller plot around the hook of his Blair pastiche. The conspiracy uncovered by the ghost is convincingly established with chilling insight. I also liked the numerous references to ghostly presences in the book, from the phantom presence of McAra to the ambiguously unreal Adam Lang himself. The fame-chasing ghost-writer is also a condemnation of the lax complicity of the public in the actions of our leaders. Harris’ book is an impressive political thriller, as well as a momentous broadside against the ‘Special Relationship’, between the United States and the United Kingdom. Angry, defiant (there was a possibility Harris would have faced libel charges from the Blairs) and gripping, a very entertaining yarn.